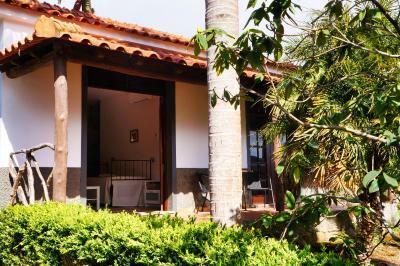 Lock in a great price for Casas de Campo do Pomar – rated 8 by recent guests! The quiet but still close to town location and cute well appointed cottages. The owners were very friendly and helpful with regard to tips on local hiking and other attractions. And the Delicious fresh bread which was left outside our door each morning! The accommodation was basic, but it had all we needed. We mostly loved the garden that the accommodation is in and the owner and staff are incredibly friendly and helpful. The traditional bread for the breakfast was very tasty and fresh every morning and there was plenty. The owners are very friendly and have good advise on where to go, what to take and they can arrange a taxi. The room has everything you need, a big bathroom and kitchenette. We had a room overlooking a nice garden. Every morning there was freshly baked local bread. Great way to start your day! Beautiful garden and cottage, breakfast (fresh bread every morning), close to many hiking paths. This was a little bit of paradise in an already beautiful Island. Steve, the host is absolutely charming and friendly. The staff also so friendly and happy to help with anything. Not 5 star like a hotel, but the relaxed atmosphere, easy facilities make it a different kind of 5 star that is much more rugged and natural. Beautiful location (in nature, walking distance to center of Santana), few lovely walks can be reached by car (eg. Queimadas forest) . Rooms are cozy, views are fantastic, fresh bread every morning is lovely, breakfast on your own terrace tastet great;)..Some reviews suggest that people were bothered by local cats..so yes you will have few fluffy visitors when having breakfast in the morning...if you don't like it, maybe book some other place..if you do like animals (cats in particular) - you can buy some cat´s food in Santana´s supermarket and have them join you for your breakfast;)..
Really nice place. Our host were really friendly to us. Would definitly recommend this place. Peaceful place, perfect for relax and rest. We enjoyed our stay. Full recommendation. Green place in the midst of rural landscape. The garden keeps most of the endemic songbirds of Madeira (Firecrest and Chaffinch). Recommended for birdwatchers. 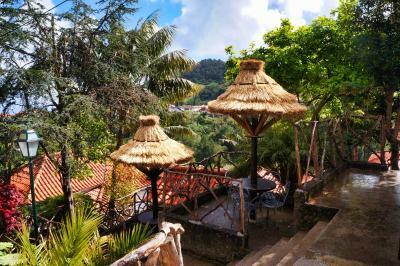 Located in the UNESCO biosphere reserve of Madeira, Casas de Campo do Pomar is surrounded by an extensive tropical garden. The beginning of the Madeira Levada walks start 3.7 mi from the property. The air-conditioned villas and rooms are all equipped with a kitchenette and cable TV. Each of the rooms features a private patio with mountainous views and some come with a hammock. 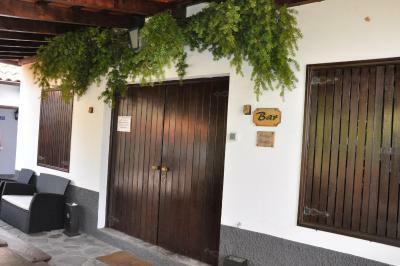 Room service is available at Casas de Campo do Pomar and a continental breakfast is served daily. Guests can enjoy a large common area, including a bar, where free Wi-Fi can be accessed. 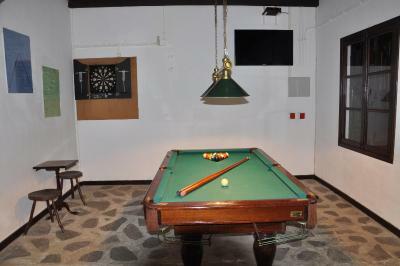 The property offers a games room with facilities for dart, billiards. The front desk can arrange many activities nearby including fishing, hiking or bicycle hire. An airport shuttle service is provided upon request. Madeira airport lies approximately 12 mi away. 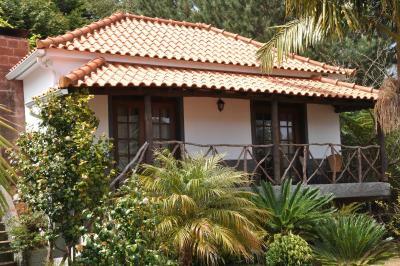 When would you like to stay at Casas de Campo do Pomar? This air-conditioned room comes with a fully equipped kitchenette. The extensive views can be enjoyed from the balcony which features a hammock. The rustic design of this room includes wooden floors throughout and contains a living area and fully equipped kitchenette. The patio looks out onto mountain views. This air-conditioned room comes with a fully equipped kitchenette. Views of the mountains can be enjoyed from the patio. This villa has a balcony, dining area and kitchenware. House Rules Casas de Campo do Pomar takes special requests – add in the next step! A charming mountain apartment up in the town of Santana, like a family house. I enjoyed the calm atmosphere after the busy towns of the coast + it is a great area for hiking. The place was bit difficult to find late at night but the staff was really helpful. I highly recommend this place for a more authentic experience of Madeira. The room smelt like mold. I woke up with a blocked nose several times throughout the night because of allergies to the mold. It was the shower curtain, it was covered in mold. Closing the door to the bathroom did not help. The bed was not comfortable. Parking was a bit of a trek at the bottom of the hill, behind the apartments and lugging the cases up the hill/ steps is a work out. I should have done this from the top road and then left the car in the parking lots afterwards. There is a fridge in the kitchenette, not pretty looking but clean and functional so as they are less shops, you can buy some things before you arrive to stock it up. Quite cold & damp. Only heating was inadequate. It was a bit chilly. February. The floor was maybe a bit cold on January but i think you can afford this. I did not like that many cats around ... from obvious reasons ... I'm a bird person. I suggest you to sterilise them. Beautiful villas with great view. Amazingly nice host, breakfast in the room with fresh bread delivered in the morning to your door. No coffee jug or machine, only instant:( The kitchen utensils were a bit of a bodge. One wine glass, one frying pan so warped you could hardly cook with it. The lighting was very dim. Spacious, calm, outside space. Lots of space compared to a hotel room for the same price. Self catering breakfast was provided, and basic kitchen facilities. Quiet location 10 minutes walk from shops and cafes.